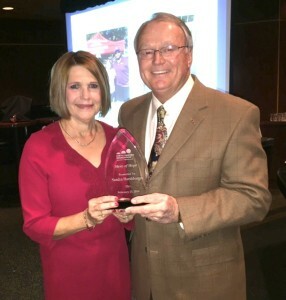 Congratulations to HPTA’s own Sandra Harshbarger (pictured right with Jim Crane) who was named the 2016 recipient of the “Hero of Hope” award, given by the Cystic Fibrosis Foundation. The award was presented by Louisiana Chapter CFF President Jim Crane, at a Feb. 25 dinner, held to recognize outstanding CFF volunteers. Sandra, a former HPTA President, was recognized for more than 25 years of extraordinary volunteer help given to various CFF causes, including HPTA’s Jim Crane State Farm Highland Open (of which she is a driving force), the annual Bert Jones charity golf tournament, and much more.